Captain Marvel has screened and Goose the Cat reportedly steals the show. We're now less than two months away from Brie Larson making her Marvel Cinematic Universe debut as Carol Danvers on the big screen and some lucky fans have already gotten a chance to see the movie. Goose has already played a pretty large part in the promotional campaign through getting his own character poster along with a few different action figures that come with some of the bigger characters like Danvers and Nick Fury. It is not clear why Goose the Cat is such a main part of Captain Marvel, but the comics point to a very different type of feline. First of all, in the comics, Goose's name is really Chewie, which Disney probably changed to separate the movie from the Star Wars franchise. Secondly, Goose/Chewie is from an alien species whose bodies contain interdimensional portals known as the Flerkens. However, that's not all. Flerkens are fierce creatures who can turn into a monster in seconds. 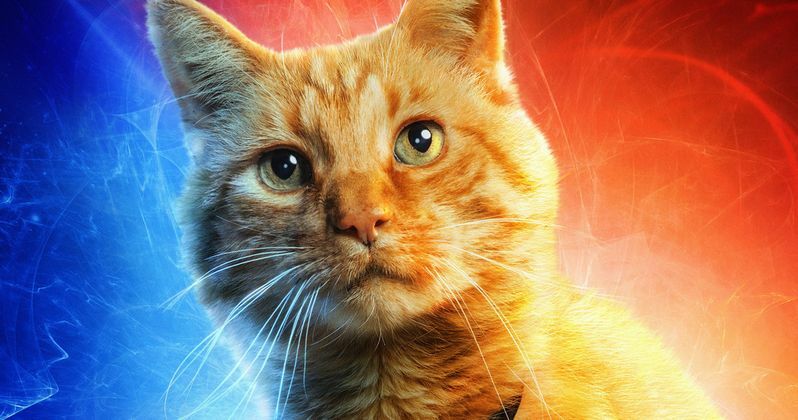 It has not been confirmed that Goose the Cat will show his alien side in Captain Marvel, but it certainly seems that he will from the early reactions to the movie. In addition to being more than a standard cat, there are a few rumors online that believe Goose will be the reason the current version of Nick Fury only has one eye. Trailers have shown the two getting along, but an action figure of Fury comes with a Goose that has been muzzled and handcuffed, leading us to believe that he and Fury have a complicated relationship. Speaking of Nick Fury, Samuel L. Jackson appears as a de-aged version of the character since Captain Marvel takes place in 1995. Clark Gregg also plays a de-aged version of Agent Phil Coulson. While MCU fans are clearly looking forward to seeing Brie Larson's MCU big screen debut, there are a lot of fans who are looking forward to seeing a young Fury and Coulson interact. It isn't clear just how many scenes the two will have together, but we're all hoping there's quite a bit. Captain Marvel hits theaters on March 8th and will start the countdown for Avengers: Infinity War, which comes out at the end of April. MCU fans are interested to see how Carol Danvers will be introduced to the MCU and how she will help the Avengers when it comes to possibly battling Thanos for a second time. Marvel Studios boss Kevin Feige has called Danvers the most powerful MCU character to be introduced thus far, but it seems he did not put Goose the Cat into the category. Maybe Goose is the strongest MCU character to date. We only have a few weeks to go before we find out. The Captain Marvel Goose news was first reported by Steven Weintraub's Twitter account.